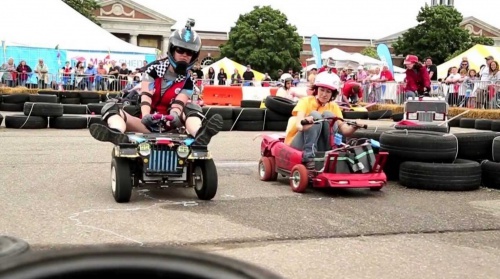 If you've been to one of the big Maker Faires, you may have run into the Power Racing Series, where seemingly ordinary people take children's toy vehicles, soup them up, put on costumes and race against each other on a short, twisty track. It's as wonderful as it sounds. We love any excuse to build things big enough to ride on, so we've invited the Power Racing Series to be part of this year's Autonomous Vehicle Competition. (And reader, they said yes!) But since we're SparkFun, we're also putting our own spin on things with a brand-new event called Autonomous PRS (A+PRS). For this event, we're asking you to build autonomous vehicles in the same, human-carrying size as the PRS racers. And like traditional AVC vehicles, they'll need to find their way around a course all by themselves. But unlike the traditional AVC, if you trust your code enough, you can hop aboard for the ride. We're going to have two race courses at this year's AVC; one for traditional AVC vehicles (under 40 pounds), and one for PRS-sized vehicles. We'll use the PRS course for both an official PRS race with real human drivers, and an autonomous A+PRS race. You can enter either race, or both, or none for that matter; it's a free country. For timing, the PRS course uses a transponder attached to your vehicle that is sensed by an overhead bridge. (PRS will supply the transponder for a $20 rental fee.) After you hit your start button, your official course time will be from the moment you pass the starting line to the moment you cross it again at the end of the race. If your autonomous vehicle doesn't make it all the way around the course, we'll still give you points for passing various checkpoints. The course will be a uniform 18-feet wide, and in true Colorado fashion, will be lined with hay bales (which are 3' long and 16" high). Our Mad Mechanical Engineer Evan recently tested out some of our distance sensors against haybales, so check out his findings. And to help out those of you with vision systems, we're going to add optical targets to each of the hay bales: red plastic plates on the left side of the course, and green plates on the right. High-tech all the way, baby. PRS vehicles are traditionally made from modified Power Wheels toys, which can often be found at garage sales for a steal. * (*Please do not steal Power Wheels toys from actual children). You can also base your vehicles on other platforms or fabricate them from scratch, as long as they meet the requirements and look great. There is no maximum weight, but they can be no larger than 36" wide, 62" long, and 72" high, including the passenger. Speaking of passengers, if you trust your skills, a member of your team can occupy your vehicle (hands off!) as it navigates the course. If you do this, we'll give you bonus points or something special that we haven't thought of yet. But note that if you do decide to ride, you'll need to bring and wear appropriate safety gear including a motorcycle (not bicycle) helmet. A passenger-capable vehicle should also abide by the PRS rule that requires a manually-operated brake (which does not include a stick or your feet dragging on the ground). Passengers will also need to be over 18; sorry, parents. It's not worth permanently traumatizing your offspring over a missed semicolon. PRS vehicles are limited to a maximum budget of $500, but note that your computers, sensors, and steering actuators are not bound by the $500 rule, and that only 50% of your battery cost counts towards that cap. (In other words, $500 covers the chassis, body, motor(s) and half the batteries.) Also note that this restriction only affects the vehicle as it sits at the starting line – your pit supplies and extra batteries (recommended) are not bound by the $500 cap. Speaking of batteries, you may use pretty much any type except Lipo, which have a habit of catching on fire if they're damaged. You may use Lithium Iron Phosphate, Lead-acid, NiMH, or pretty much any other chemistry. Your system voltage can be up to 48V, and your total motive power is limited to 1440 watts. This will be enforced by a fuse in your system which we'll want to see during vehicle inspection. To find your proper fuse rating, divide 1440 by your system voltage. For example, if you're running at the maximum 48V, you'll need a 30A fuse. Your computers and sensors can bypass the motor fuse if you wish. Before you build, please review the PRS rules and A+PRS rules, and you can always ask us questions at AVC@sparkfun.com. Before you're allowed on the track we're going to be inspecting every vehicle to make sure you're following the rules and are otherwise safe. Safety is a concern with vehicles this big, and you could be disqualified for missing something important. But it's worth noting that there's another PRS rule called the "I'm Not Even Mad" rule, which states that if you break a rule in a completely outrageous way, we may let you get away with it. So if you're going to purposely break a rule, go big. Finally, remember that A+PRS is a spectator sport, and that the primary goal is to have fun. Make your vehicles look great. Wear costumes. Practice a team dance move. Bribe the judges (and the audience!). If you're taking this ultra-seriously, you're probably in the wrong place (may we suggest DARPA?). 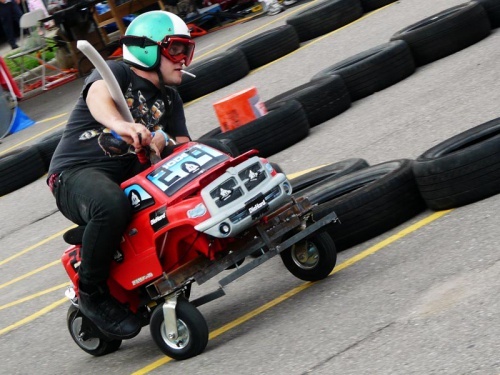 Good luck on your vehicles, we'll see you at SparkFun on September 17th! Please tell me this will be broadcast via Twitch or Periscope or archived on YouTube. I would love to watch this. The autonomous aspect is great and the "skin-in-the-game" clause is the best. I'd also love to see Sparkfun host fully autonomous robot battles instead of the "RC Car" demolition derbies usually done. Great work, looking forward to this. We're currently planning on livestreaming all three AVC events: Traditional AVC, PRS, and Robot Combat. In the video the max width is specified as 32 inches, but on your rules page it is 36 inches. Did the max width change, or is one of these a typo? I ask because I already started my build with a 36 inch width and it is difficult to change. Funny story, I almost bought a surplus Cray 1, but it took up half a railroad boxcar and I didn't have a place to put it at the time.